Although only a small settlement with a population of around 1800 St David's qualifies as a city as it has a magnificent cathedral. The building dates from 1181 but the location has been a place of pilgrimage from around 500AD. People still flock to the St David's today to visit the cathedral and enjoy the unique atmosphere of the town. The whole coastline lies within the Pembrokeshire National Park. The cathedral houses the remains of St David and is reckoned to be the holiest place in Wales because of this. Next door, so to speak, are the ruins of the former Bishop's Palace which dates from around 1320. St David's overlooks the magnificent St Bride's Bay which forms a crescent at the end of the small peninsular. Although not strictly a coastal town St David's is less than a mile from the coast and is linked by a couple of small roads to the coast. Around two miles from the city lies St David's Head which offers spectacular views along the Pembroke coast. 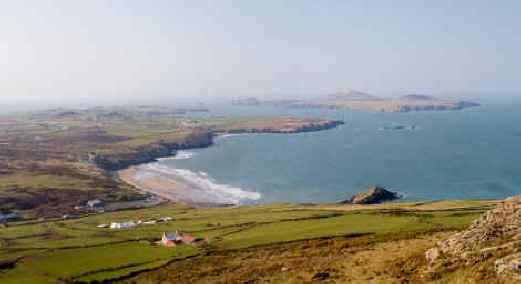 Below the headland is Whitesands Bay which has a sandy beach and is a popular surfing location year round. There are several other beaches within a few miles of St David's. Just offshore from the headland is Ramsey Island which is an RSPB reserve and further out can be seen some more rocky islands known, rather quaintly, as the Bishop and Clerks rocks. See below for how to visit the island. The Pembroke Coast Path goes along the headland here and links Tenby in the south with Fishguard to the north of St David's (this is now part of the Wales Coast Path). Solva - is a picturesque village around 3 miles from St David's, it was reputedly once used by smugglers. Newgale - is a small seaside resort with a three mile sandy beach some six miles from St David's. Wales Coast Path - known here as the Pembrokeshire Coast Path goes around the headland.